For all of Nintendo's dramatic ups and downs over the years when it comes to their consoles, what have remained consistently excellent over the decades are their first-party games. That is especially true when it comes to their side-scrolling platformers, for which the House of Mario established a winning formula back in the mid '80s that's never stopped paying off. 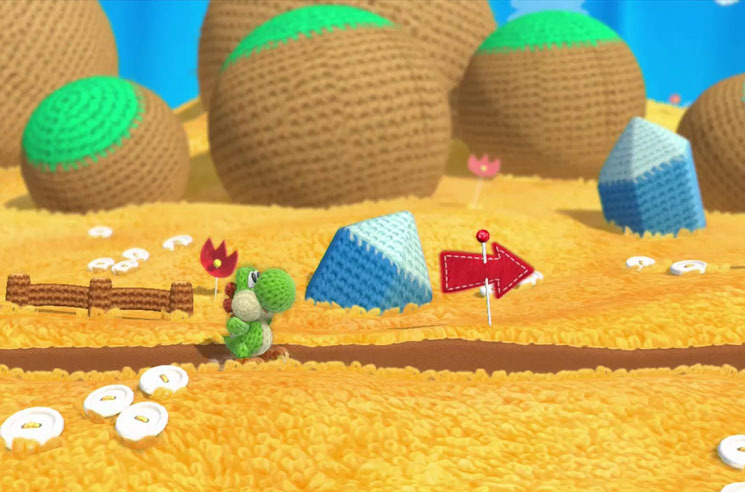 So it's not a surprise that Yoshi's Woolly World — a spinoff title starring the Italian plumber's dinosaur pal Yoshi, who first appeared in 1990's SNES title Super Mario World but hasn't had his own console title since '97 — is incredibly fun and quite clever. The surprise is that Nintendo didn't actually make it themselves. Though they published and quality-controlled it, Nintendo handed the development reins over to the appropriately named Japanese studio Good-Feel, the good folks behind similarly successful Mario spinoff Kirby's Epic Yarn. Once again, they took a handicraft-inspired approach to their graphics, turning the familiar Mushroom Kingdom-esque world into one built entirely out of yarn and cloth. If the cute overload art design didn't give away the all-ages appeal of the game, it also features nicely implemented two-player co-op — like swallowing your friend and spitting them into otherwise-inaccessible areas — so you can help little loved ones.